This highly interactive learning object allows students to build their own tales using the common 160 narrative elements. 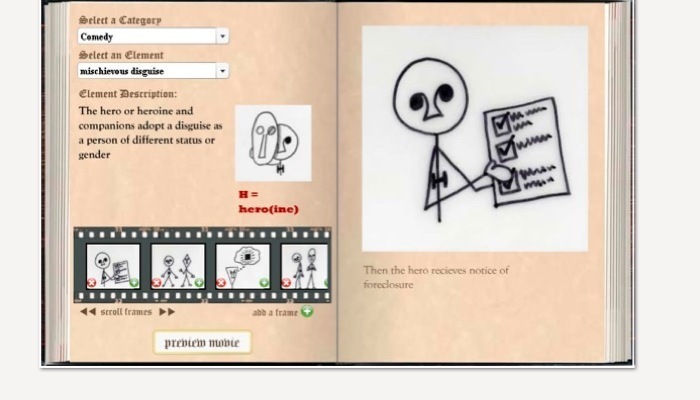 Set in a storybook interface, the students select a series of narrative elements and use the provided generic graphics. The student then tells the story in his/her own words. After saving, the activity plays the animated graphics back in the order set by the student. The students’ works are shown over the graphics as subtitles. This allows other students to view the movies and analyze which elements are being used to tell the story. This entry was posted in Interactive, learning activity and tagged english, flash, folktale, narrative, writing by Britt Carr. Bookmark the permalink.